Literature indicates that there is limited research on the national and organizational level decision processes to develop and deliver e-learning programs. 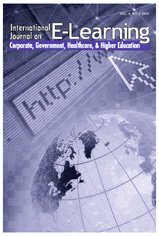 In this paper, existing e-learning literature is analyzed in terms of national level factors (national culture, readiness for new technology, and infrastructure), organizational level factors (organizational culture, organizational capability, and organizational readiness), and program level factors (teaching models, learner variables, instructional decisions, faculty development, and technical considerations) for instructional development of e-learning programs. Pursuing e-learning programs that will result in more effective learning transfer outcomes, this study proposes a comprehensive approach of e-learning development to be used by e-learning designers at various levels in different instructional environments. Lim, D.H. (2012). A Comprehensive Approach of E-learning Design for Effective Learning Transfer. International Journal on E-Learning, 11 (1), 55-71. Waynesville, NC USA: Association for the Advancement of Computing in Education (AACE). Retrieved April 20, 2019 from https://www.learntechlib.org/primary/p/33292/.